Aligarh Muslim University Admissions 2019: Aligarh Muslim University Admissions 2019 Exam dates has been announced by the University. Aligarh Muslim University (AMU) was started in 1920. The main purpose of the establishment of this university is to provide quality education to students in different departments. At Present, this University is offering undergraduate programme, Postgraduate Programme, Diploma, Certificate and Ph.D. level program in 13 faculties. Aligarh Muslim University offers admissions to foreign candidates also. and the seats for candidates of SAARC and Commonwealth countries. Students can get admissions in AMU based colleges, Schools, and Centres. Students want to take admission in AMU can fill application form by visit the official site of AMU, Controller Exam. Latest Update: Aligarh Muslim University Admissions 2019 Application Form has been released on 01 February 2019. AMU has announced the all exam dates for 2019 session. How to Apply for AMU MD/ MS/ M.Ch & MDS Courses? Register yourself as a new user and provide your details of Name, Address & course of choice. Then, Log in using the username and password generated at the time of registration. Fill the form with respect to personal and academic details and also Upload your photograph and signature. The Application Fee can be paid through net banking or debit/credit card. Payment can also be done through bank challan of ICICI or Canara Bank or Demand Draft. 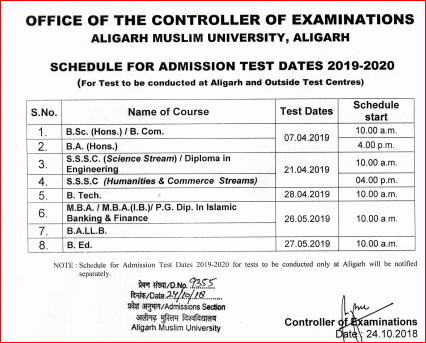 The Office of the controller of Examinations – Aligarh Muslim University, Aligarh released the Schedule for Admission Test Dates 2019-2020. For the test to be conducted at Aligarh and Outside Test Centres. 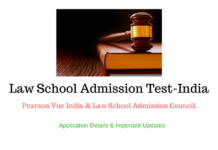 AMU UG Admission 2019: AMU University offering admissions to B.A (hons. ), B.Sc(Hons. ), B.Com(Hons. ), BFA, B.P.Ed and B.Ed programs in different specialization. 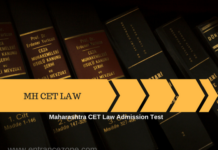 for candidates who want to get admission in these courses, the minimum eligibility criteria for them is should have got passed in the 12th class examination with at least 50% marks excluding B.Ed/ B.Li.Sc and B.P.Ed because for these courses Bachelor’s degree in the relevant branch is compulsory. 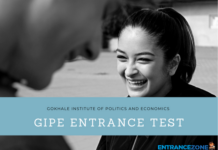 admissions to the students will be given on the basis of the scores of department-based test and entrance exam which will be conducted at different centres. B.Li.Sc – B.A. / B. Sc. / B. Com. / B. Th. / BA-LL.B / BFA with a minimum of 50% aggregate marks. 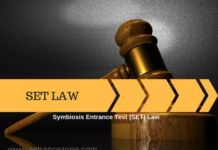 B.Ed – 50% marks in B.A. / B.Sc. / B. Com. / B.Th. Candidates who want to apply for B.Com (H) after passing Diploma in Secretarial Practices can apply. In BA (H) programs, seats are reserved for Kashmiri Migrants and for candidates from recognized Madrasa or Institution. this is to notify that Departmental Entrance Test will be conducted at Aligarh only. AMU offering full-time B.Tech, BE (evening) and B.Arch in various specializations. candidates who want to get admissions in these courses the minimum eligibility for them is they should be passed in 12th class with PCM. This university conducts its own entrance exam for granting admissions to these courses but for B.Arch candidate also have to qualify an additional aptitude test which is also conducted by the University. For BE (Evening) admissions 25 extra marks will be given at the time of admission to the candidates with relevant experience in Govt. or Semi-Govt. organizations. Students must note that AMU will conduct a common test (Paper I) for both B.Tech and B.Arch programs. AMU offering admissions to MBBS, BDS and BUMS will be based on the performance of the candidates in NEET exam. 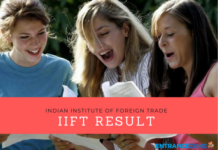 Pre-Tib (BUMS) admission will be offered on the basis of the result of the admission test. 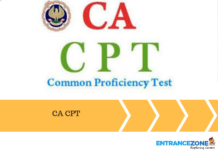 The minimum eligibility criteria are 10+2 (PCB) with 50% aggregate marks. In postgraduation, AMU is offering M.Sc, MA, M.Ed, M.P.Ed, M.Com, MTTM, MFA and LL.M programs in various specialization. 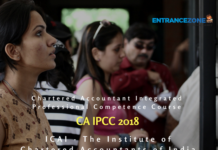 the candidates who want to get admission in these courses the eligibility criteria for them is they must have a Bachelor’ degree with minimum 50% aggregate marks. For M.Ed and M.P.Ed courses, candidates must have B.Ed and B.P.Ed degree respectively. final selection will be done on the basis of the candidate’s performance in the Departmental Admission Test. M.Sc. Agricultural Microbiology B. Sc. (Agriculture/ Biosciences/ Microbiology)/ Industrial Microbiology/ Biochemistry/ Biotechnology/ Bioinformatics/ Molecular Biology) with 55% marks. Agriculture Entomology B.Sc. (Agriculture/ Horticulture/ Forestry) with minimum of 55% aggregate marks. Plant Pathology B.Sc. (Agriculture/ Horticulture)/ Forestry) with minimum of 55% marks. Remote Sensing & GIS Application Bachelor’s Degree in Geography / Geology / Statistics / Physics / Chemistry / Computer Applications / Mathematics / Botany / Zoology / Forestry / Wildlife / Environmental Science / Agricultural or Soil Sciences / Civil Engg. / Computer Engg. With minimum 50% aggregate marks. B.Sc. with minimum 55% marks in aggregate with minimum 60% marks in Mathematics /Statistics. Two seats in each program in Agriculture are reserved for the candidates belonging to the Council of Agriculture Research (ICAR) quota. For M.Sc in Wildlife Sciences/ Biodiversity Studies, AMU will conduct a Combined Entrance Test of 100 marks with 70% weightage to MCQs and 30% for Short Answer Type Questions. AMU is offering admissions in M.Tech, MBA, and MCA for Full time for the duration of 2 or 3 years respectively. 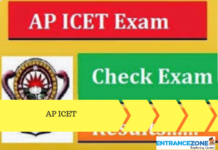 The eligibility criteria for getting admissions in these is the candidates must have done B.E/ B.Tech in the relevant branches for getting admissions in M.Tech and for MBA and MCA any bachelor degree is sufficient but Students must note that Mathematics will be a compulsory subject at UG level to get admission in MCA. 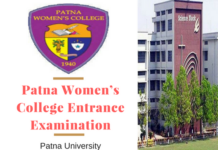 For admission in MBA (IB) entrance exam will be conducted at Kolkata, Aligarh, and Kozhikode while MBA (Agribusiness Management) entrance exam will be conducted at Aligarh only. Final admission will be granted on the basis of GD and Interview. The candidates who have qualified GATE exam are eligible for admission in M.Tech. if seats remain vacant then AMU will conduct a separate entrance exam. AMU is also offering admission in MD/ MS. MDS and M.Ch in postgraduation, it will be granted on the basis of the scores obtained in NEET PG which is followed by counselling. 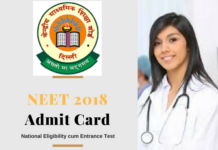 But for MDS and M.CH admission will be granted on the basis of scores obtained in NEET MDS and NEET SS.the candidates who hold the MBBS degree are eligible to apply for MD / MS programs and MS/ DNB for M.Ch program. Firstly, fill the application form through online mode by visiting the official site of AMU. Secondly, pay the processing fee of Rs. 500 through Net-Banking or by Credit/ Debit Card. Finally, send your application form in A4 size envelope on the address of Admission Controller, AMU by speed post/ courier/ registered post or in person. rd week ofrd week ofFood Technology Diploma in Mechanical / Production / Chemical / Environmental / Agriculture / Electrical / Refrigeration & Air-conditioning / Instrumentation & Control / Electronics / Computer / Civil / /Plastic Technology/Architectural Assistantship / Interior Design/ Construction Technology Leather & Footwear Tech with minimum 60% aggregate marks. B. Sc. (Science / Industrial Chemistry / Life Sciences / Home Science) with minimum of 50% aggregate marks. General Nursing & Midwifery 10+2 with PCB & English with minimum of 40% marks. 10+2 in Arts (Mathematics, Biotechnology, Economics, Political Science, History, Geography, Accountancy, Home Science, Sociology, Psychology, Business Studies, Philosophy) and English Core / English Elective or Health Care Science Vocational Stream with minimum 40% marks. MBA Environmental Awareness, Quantitative and Numerical Ability, Comprehension and Verbal Ability, Reasoning and Intelligence and Data Analysis and Interpretation. B.Tech Questions put up from Physics, Chemistry and Mathematics subjects. The admit card will be announced through online mode only. AMU Admit Card 2019 will be available before 1 or 2 weeks from the exam date. No Hall Ticket will be sent to the candidates through post. Admit Card is a very important document. No candidate will allow giving exam without it. Applicants have to affix a passport size coloured photograph in the given space. The result will be declared after a month of the completion of the examination. AMU 2019 result will be announced through online mode. Applicants need to fill their roll number and other required information to see the result. 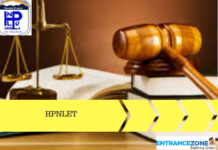 It is also advised to aspirants to take the printout of the result for further use. AMU will grant admissions in the courses offered by them in two ways i.e, a Departmental test which will be conducted at Aligarh and Entrance Exam which will be conducted at designated centres. 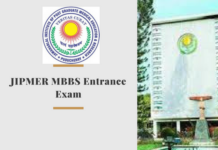 AMU will give admissions in BA (H)/ B.Sc (H)/ B.Com (H) and BSW on the basis of scores in the Entrance Test (All India Level) which AMU has conducted. In BA (H) (Shia/ Sunni/ Foreign Languages)/ B.Sc (H) (Agricultural Science)/ BRIT/ B.P.Ed and B.Li.Sc admissions will be granted through an entrance exam conducted by the AMU. For admissions in BA-LL.B/B. Ed and MBA entrance exams will be conducted at Aligarh. Kozhikode and Kolkata only. For admission in B.Tech entrance exam will be conducted at different locations and B.Arch and BE (Evening) admissions will granted through Department-Based Tests. 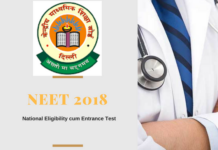 To take admissions in MBBS/ BDS and BUMS candidates must have scored well in the NEET exam. For admissions in MA/ M.Ed/ MFA/ MCA/ M.Sc/ M.Li.Sc/ M.P.Ed/ MIRM/ MFA and MHRM entrance exam will be conducted by the concerned departments of AMU. For admissions in the M.Tech program, the GATE qualified candidates can apply. And after that seats are vacant then AMU will conduct its own Departmental Admission Test. Admissions in MD/MS will be based on valid scores of NEET PG and for MDS admissions will be based on the valid score of NEET MDS. For admission in a Ph.D. program, AMU will conduct Written Test followed by an Interview. Candidates can apply for the admission through online mode on the official site of AMU, controller Exam. Read about Maulana Azad National Urdu University Admissions Here. 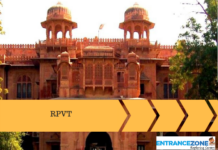 aligarh muslim university admission 2019, amu entrance exam 2019, aligarh muslim university admission 2018, amu entrance exam for class 11 2019, amu entrance exam 2018, amu application form 2019, amu admission 2019 class 9. Thanks a lot Sir For giving this all information about AMU……. msc (botany) entrance exam date ? ?